Next strip's inked and scanned. Hey! 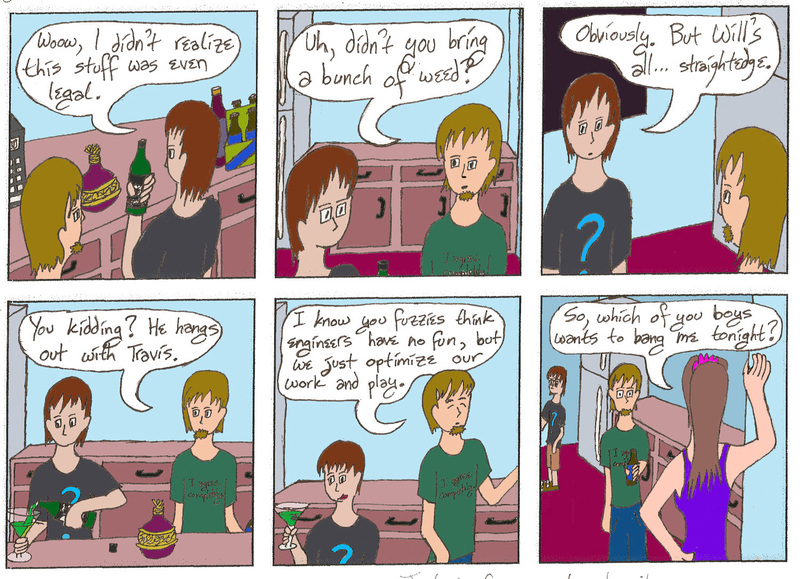 The last two pages of Chad's World are now online! Enjoyz! ...this may or may not have been largely inked while watching episodes of My Little Pony Friendship is Magic. Omfg. SO MUCH CUTE. Also, if your mother tells you, "this Bridesmaids movie got really good reviews! And it looks interesting!" every alarm bell in your head should be going off. They certainly were in mine, but I went to go see it with her anyway, because for one there are very few movies she is willing to see (she actually listens to critics, and will go see a movie only if it has a retardedly high rating. ), and for two well I don't exactly see many chick flicks, and I do occasionally need to get the girlies out of my system. I spent 80% of the movie wanting to hide under my seat, optionally evaporating. After the movie, I... don't even want to touch on. ^_^ On the other hand, Kristen Wiig is a serious baller. So props to her for writing and starring in her own movie and kicking off her comedy career in her late 20s/early 30s.